MP3 is always good. I think what most members seem to do is to add their audio file to the site's audio section, and then they just post a link to the audio clip as it appears on FOTMD. Any audio or video files you add to your profile page sections/tabs will appear and be searchable in FOTMD's Audio or Video collections, as seen in the top navigation bar for the site. Thanks, Lisa. I was able to download the file after you changed the setting. I had to delete the "dms" at the end and add the "." before the mp3 to get it to play in "iTunes". 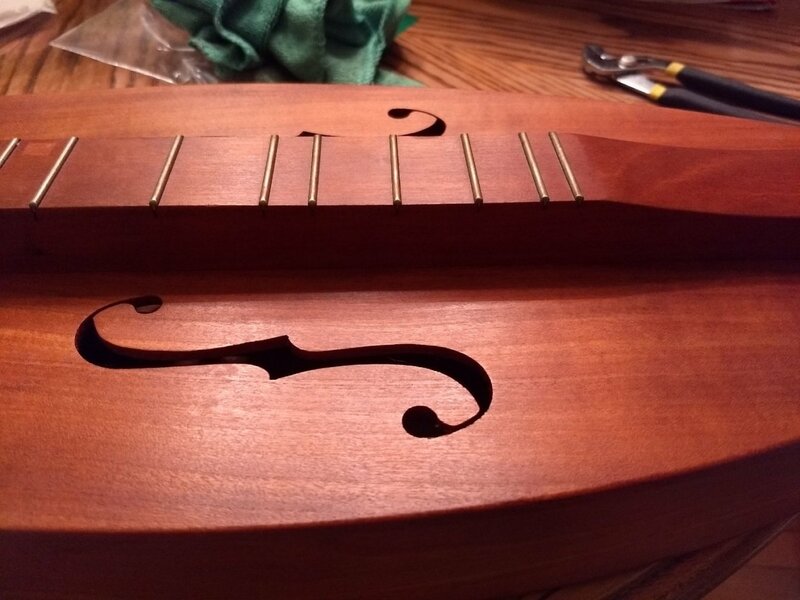 David, you did a good job in restoring the Keith Young dulcimer. It sounds great. Thanks for sharing your work with us. Well I was able to play the song with little trouble. The dulcimer sounds great, Dave. It's got a nice deep voice. I say "little" trouble because Windows first asked me what software to use to open the file (shouldn't that be automatic?) and then claimed the file extension was unrecognizable, but when I told it to play the file anyway, it worked fine. Strumelia, is there a preferred format for audio files? I just assumed mp3 would work and didn't try to play it after I loaded it. Ken, can you please try that again? I've changed an audio setting on the site. Dave... sounds wonderful! 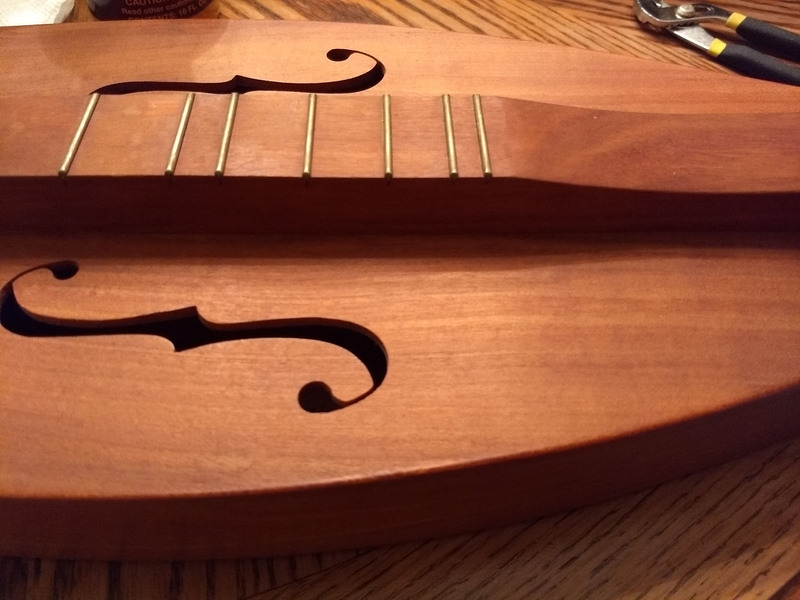 If he were alive, Keith Young would be super pleased at how you've brought his dulcimer back to how it was when it was first completed... perfect, gleaming, and brand spanking new. Irene, I had a little trouble with the soundbite too. But it worked when i did this: click on the text instead of the picture icon, which actually downloads the file to your computer. Then RENAME the file so that it ends in .mp3 (nnot just mp3 without the . ) After renaming, my usual music programs will open and play the file on my computer. It's finally back together - with no glue on the nut or bridge and new strings. I'm really happy with the results. I've attached an 'after' picture also of the whole instrument, and a pretty rough around the edges sound sample. I'm grateful to everyone for the sound advice (pun intended) and the encouraging words. This has been a good experience. You did a great job making a new fine tuner!! I too personally suggest you not use any glue on the nut or bridge when putting them back in. As long as you don't remove all strings at once, you'll never have to worry about them moving around or getting lost. String pressure hold them in beautifully. It's handy to be able to easily remove them if needed, without the risk of them cracking due to stubborn old glue. Great job on the fine tuners. James Jones sells a great hard case. Here is the link. Personally I would not put any glue on the nut or bridge. String pressure alone will hold them in place. I would not have taken all the strings of at once either, but again, that's just me; I remove and replace one string at a time so that things stay together. So it turns out i do have two original fine tuners, and managed to make two more this evening. Also picked up some strings at lunch, so hopefully tomorrow I can string it and see how it will sound. 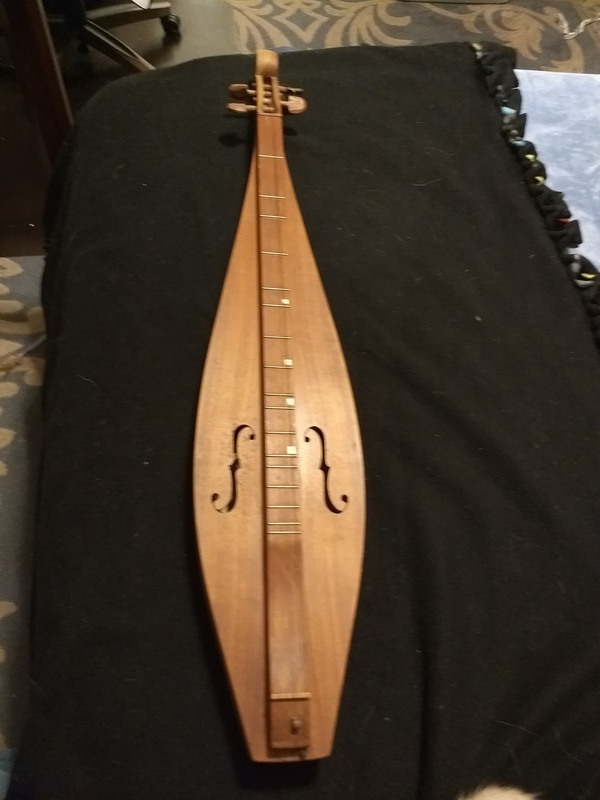 My other dulcimer is a bit smaller and I'm curious at this point to compare. Attached a pic of the tuners (originals on the left), the bridge, and the nut. The nut actually has a spot of glue on it, and I assume it was fastened in when new. I have some titebond original and titebond hide - either would work i suppose to refasten the nut? Or something else? Great advice on the tuners! Any suggestions as to a case for this? My advice is to get one extra button to keep in your case. 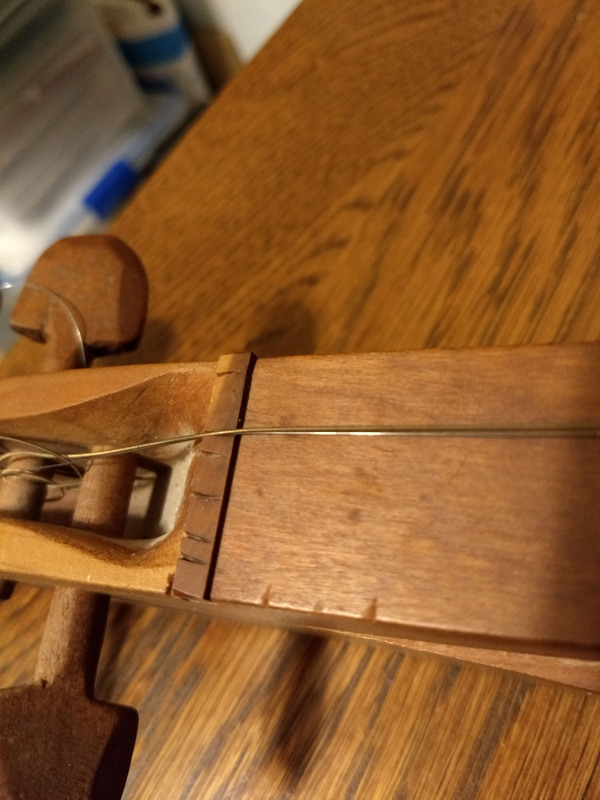 Might as well if someone is already making them... and I found that if my string breaks at the bridge or tail piece area, the fine tuning button can come off the string and literally fly off across the room. This actually happened to me twice over the years. Now I keep a fine thread threaded through all the buttons' holes and tied in a little loop..it's not very obtrusive and prevents those buttons from 'making a break for freedom'. Otherwise, if you're sitting in the grass somewhere or are someplace playing at night... you may just have to kiss that little wooden button goodbye. lolol Never hurts to have a spare! David D. It looks in your initial pictures like the fine tuner for the bass string is down where the strings curve under the end of the fretboard to anchor. So you may need to only get 2 made to match. 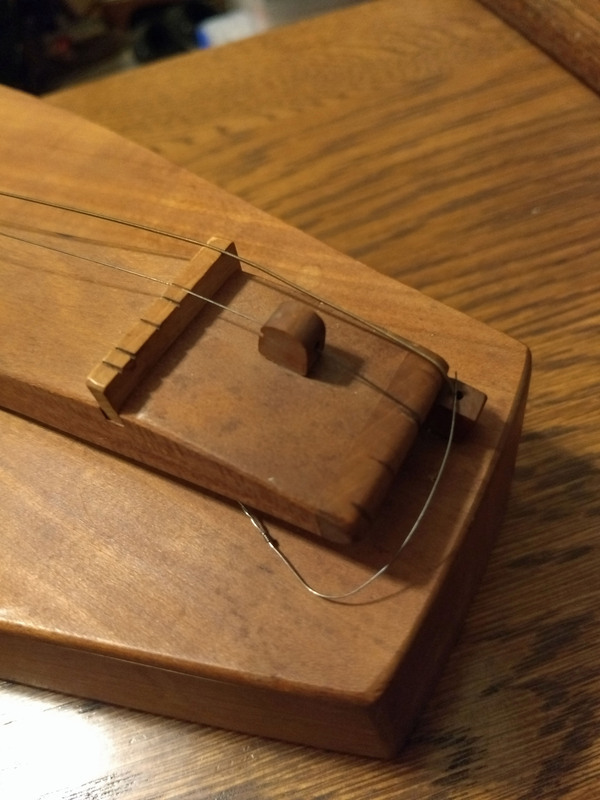 Dave D, if you or someone you know is good at woodworking, I'd recommend have them create two or three additional little fine tuner beads, to match the single remaining one on your dulcimer's middle string near the tail. My dulcimer has all 4 beads, and I can tell you that if you have wooden tuning pegs (as you do), these 'fine tuner' beads really do work well to get you to that last little bit of higher or lower tuning on each string. The way Keith made them is so smooth working, and they fit perfectly with this particular style of his dulcimers. Strumelia:Yeah, looks like it made the water spots almost disappear- nice results! Thanks for posting that before/after photo. And thanks Dusty for that wood treatment recommendation. I can't take credit for this. I learned about Howard Feed n Wax from this video by Bing Futch, and Bing credits FOTMD member and luthier extraordinaire David Beede. It sure does wonders for an old instrument, doesn't it? Yeah, looks like it made the water spots almost disappear- nice results! Thanks for posting that before/after photo. And thanks Dusty for that wood treatment recommendation. That's pretty significant. Glad it worked for you. I may have to get some for some of my older dulcimers. So I've uploaded a 'before' and 'after' with just one application of the Howard Feed and Wax. It really helped bring out the cherry. And it turns out the nut is loose like the bridge, and fits very snugly into a slot at the head. Yes, Grand is a good description! I appreciate very much the help and comments. It looks like my local Home Depot carries the Howard Wax, so I'll stop there on the way home and pick some up. I cleaned the instrument with a damp cloth as suggested earlier. The paper towel I dried it with came away yellowish, so I'm not sure what is up with that. I know laquer wouldn't come away with water, and I don't think an oil finish would either. Anyway, I'll try the Howard Feed and Wax and let you know. Dave, you've received solid answers to most of your questions. Aren't FOTMD folks grand? I have one suggestion. If the wood feels dry, it probably is. You might try a product such as Howard's Feed n Wax. You put a tiny bit on a rag and rub it into the wood. Then take another rag, wipe off any excess, and let it sit 20-30 minutes. If the wood is seriously dried out you might need more than a tiny bit since the wood will soak the stuff up. But start with as little as possible. Use it before you put on new strings so you can get to the fretboard, too. My guess is the dulcimer will show its health and happiness by really shining. I use it periodically on all my dulcimers except the one that has a heavy lacquer finish. Depending on when Keith started doing this as a standard thing, there 'might' be on your dulcimer a tiny hitch pin on the melody string SIDE of the fretboard, about halfway down. 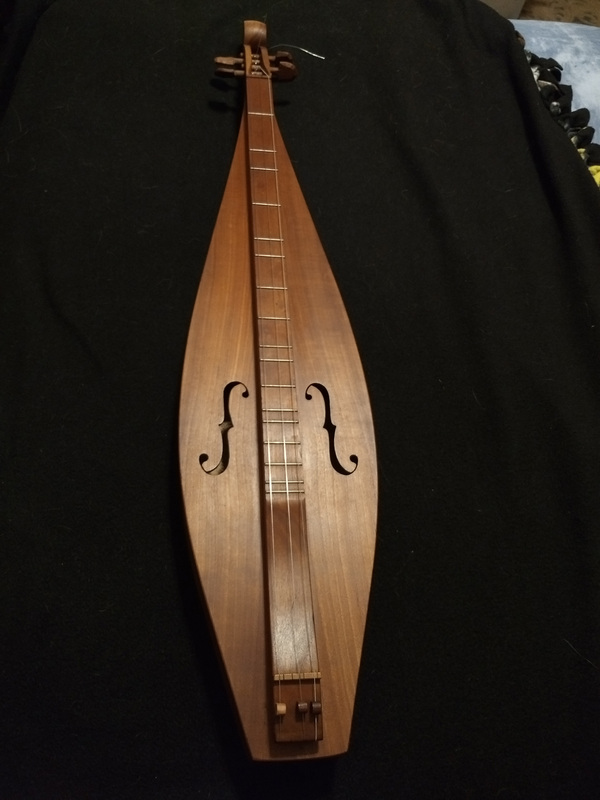 Mine has one, but my dulcimer is later, from around 1997 or 98 I think. It was meant for if you want to temporarily switch from a double melody string to a single melody string. You would just loosen the string nearest the edge and pull it down on the side of the fretboard, out of the way, in order to play with just a single melody string for however long you wanted. I thought it might also be handy if you always play with one melody string- in that if you broke your melody string in the middle of a jam or workshop, you could theoretically have a 'spare' ready to just tighten up and keep playing! Me, I personally like the sound of double melody strings, so I never used that pin that Keith had installed on my dulcimer. Poor choice of words on my part, as the bridge does seat nicely in the slot with no wobble. I was mainly concerned that it was at one time glued in and had come loose. I'm really impressed by the precision of the fit after all of these years (and the construction of the instrument for that matter - wow!). I, too, have a KYoung teardrop-- mine was built in'77. Keith made wonderful instruments! 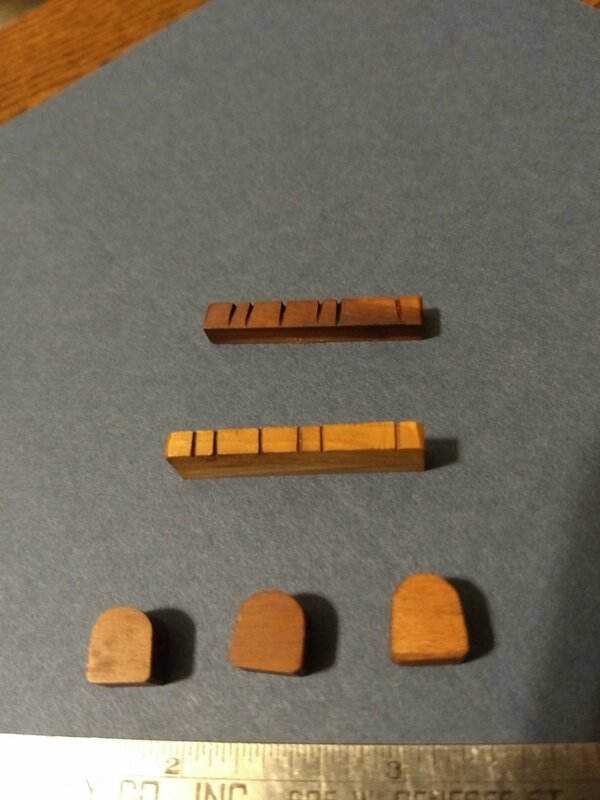 The wooden tuning beads work nicely to make fine tuning adjustments. Keith's bridges have a SLOT into which they fit nicely. This is confirmed in the photos. In one respect, if they are not glued, they can be called 'floating' since they can be removed once all strings are off. However, talk about moving or determining the location of a 'floating' bridge is just not applicable here. Keith located the deep bridge slot exactly where it needs to be to be in tune with the fret placements, and the bridge drops into that slot. No need to figure out where to put the bridge. Keith typically provided bridge and nut string slots that could be used to accommodate various ways of stringing, such as: Four equidistant strings. Three strings with a bass, a middle, and a single melody string. And 4 strings using bass, middle and a pair of melody strings. You can see this string slot choices setup provided by Keith in your photos. 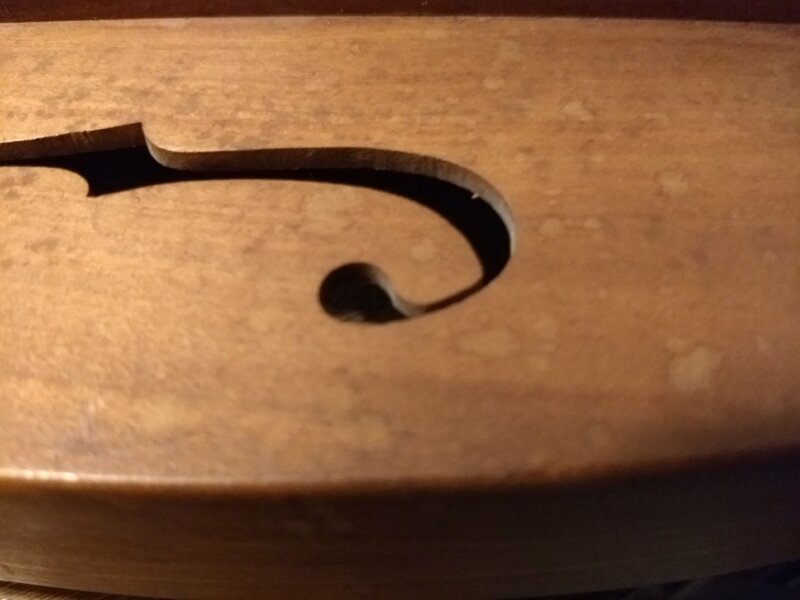 BTW If you choose to play with a noter and a single melody string, I recommend using the melody string slot closest to the edge of the fingerboard, which would give just a bit of extra space between the melody string and the middle string- this helps in avoding bumping into the middle string with one's noter. Your Young teardrop is very much like mine (you can see mine in the logo at the top of this site). You've got yourself a real beauty, a treasure! It will become more valuable with time if you don't make structural changes to it. Enjoy that wonderful dulcimer! 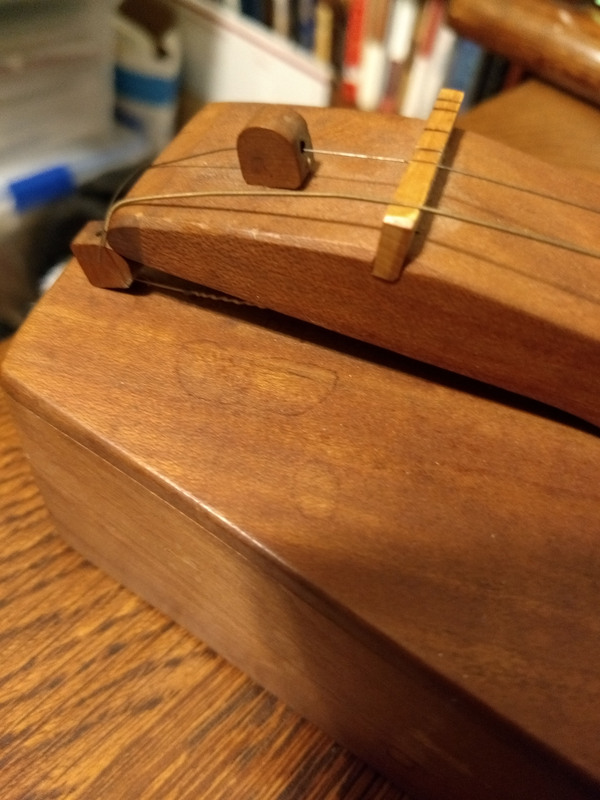 The notches on the nut are for setting the dulcimer up in one of two ways: 1st way - four equidistant string set-up or 2nd way - bass, middle, and double melody string set-up. Keith put the wooden bead fine tuners on all of the strings. A standard set of dulcimer strings should work just fine. Bass string .020-.022, Middle string .012-.014, and Melody strings .010-.012. Once you have located the correct position for the bridge utilizing the method give by Ken Hulme, you can mark the correct position on the fret board so it can easily be relocated if it shifts position. Strings are dependent on the Vibrating String Length (nut to bridge distance) and the open tuning you want for the strings -- DAA, DAd, CGG, etc. You can certainly leave things alone for now and see how it shakes out. I don't remember what finish Keith used on his dulcimers, but someone here will know. Probably linseed oil, but don't quote me on that. For now, clean with a water-damp cloth. With a floating bridge, never remove all the strings at once. Remove and replace one at a time to keep the bridge in place. If it sounds really "off" once you've tuned it, it's possible the bridge has been nudged. Take the distance from the inside edge of the nut to the top of the 7th fret, double that, and that's where the inside edge of the bridge goes, at least to start. The intonation can be tweaked slightly from there. Hi. I just bought this instrument and had some questions. It's a Keith Young #545, made in Nov 1980. It looks like solid cherry. Thought maybe someone who is familiar with these could help me out. I've attached some pictures. There are only two fine tuners on the instrument. 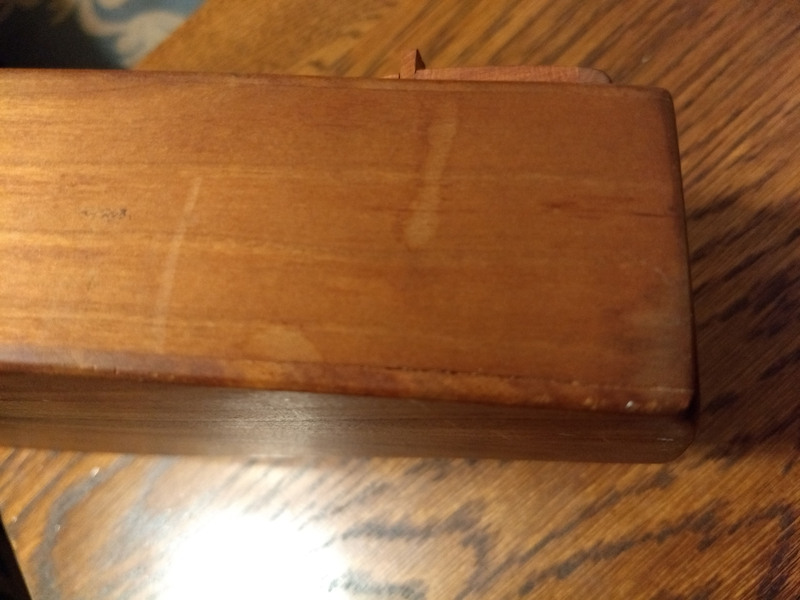 I have some old cherry stashed away and I think I can recreate them, but were there originally one for each string? The bridge floats. I assume it was built that way? (I find no evidence of glue). One of the sides appears to separating from the bottom just a hair toward the base. Any reason not to just leave this alone for now? The finish has what appear to be water spots. Not sure of the original finish, but the instrument feels 'dry' like maybe it was an oil finish. I'm pretty good with leaving the finish as is, but can I safely clean it, and if so, what with? There a multiple notches for the strings at both the nut and the bridge. The setup for a four string is pretty easy to see, but why the other notches?